Bethesda is hoping that players will be able to make their ideal character first time in Skyrim. Skyrim design director Todd Howard said that the streamlining of some of the game's systems compared to previous Elder Scrolls games is not about increasing accessibility for new players, but removing confusion for everyone. For Skyrim, Bethesda has reduced the number of statistics and eliminated certain skills, like Hand to Hand. It wasn't about dumbing things down though, as Howard said that the Elder Scrolls game sold well enough without stripping the complexity out of them. The problem, he said, was that previous Bethesda games had asked players to make choices on skills and classes before they had proper understanding of what they did, which was less than ideal. "In our games or others' games, they give you a character menu and say, 'Who do you want to be, what powers do you want?' [Players think,] 'I don't know, I haven't played yet!'" What Bethesda was trying to avoid, he said, was putting players in a situation where they felt they'd made bad choices. "What happens in Oblivion is you start the game, play for three hours, and then think 'I want to start over, I chose wrong.' So we'd like to sort of alleviate some of that. I also think the controls work better [too] ... it's more elegant." Bethesda's never going to make everyone happy when it changes something. Some players will like a lot of complexity in their RPGs, while others can't stand it. Whichever camp you might fall into though, it's hard to argue that removing confusion is a bad thing. You can build amazing systems, but if no one can figure out how to use them, then the effort is wasted. 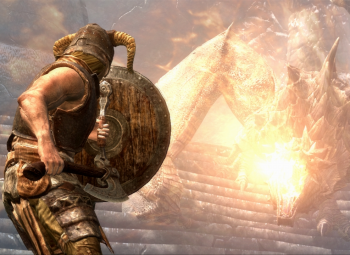 The Elder Scrolls V: Skyrim comes out for PC, PS3, and Xbox 360 on November 11th.